Our Mission is Growing Disciples of Jesus Christ. Serving Christ in the world. 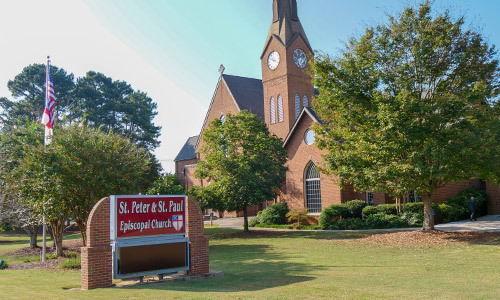 Education Ministries at St. Peter & St. Paul include Children’s Ministry, Youth Ministry, and Adult Christian Formation. We believe that children and youth are not the future of the church, they are the church NOW. Whenever appropriate, we seek to integrate children and youth into the rest of parish ministries, including reading scripture and prayers in worship, serving the chalice, on service ministries and elsewhere. A Youth Vestry Member has an important voice at Vestry meetings. ​We also believe that discipleship is a Christian practice for all ages, engaging adults as well. Many of our activities are multi-generational and inter-generational. We also have ministries that address the needs of specific age groups. Children’s Ministry grows disciples of Jesus Christ among children from infants through 5th grade, and their families. Our Nursery supports several parish activities, especially Sunday School and the 10:30 service. We are also involved in several programs, including Communion Classes, Blessing of the Animals, Advent wreath-making, the Family Service on Christmas Eve, Shrove Tuesday Pancake Supper, Programs in Lent, Vacation Bible School, and other parish-wide events. Children’s Ministry also supports Worship Ministries, including Acolytes and Children’s Choir.For more information, Click Here and contact Director of Children’s Ministry, Camie Schade at cschade@peterandpaul.org. Youth Ministry grows disciples of Jesus Christ among teens from 6th through 12th grade and their families. We also support high school graduates and college students. Our activities include Sunday School, Evening Youth Group (one for Middle School, one for High School), special trips, activities, retreats, and annual High School Mission Trips. We are also involved in multi-generational and inter-generational events such as the Advent wreath-making, the Family Service on Christmas Eve, Shrove Tuesday Pancake Supper, parish programs in Lent, Vacation Bible School, and other parish-wide events. Youth Ministry also supports Worship Ministries, including Acolytes and Youth Choir.For more information, Click Here and contact Matt Martin at mmartin@peterandpaul.org. Adult Christian Formation grows disciples of Jesus Christ among adults and their families. We also provide evening classes & groups, a fellowship group for 20s & 30s, several weekday Bible studies, retreats (for men, for women, and for the whole parish). We also sponsor special events and programs, including multi-generational and inter-generational programs. We also have Discipleship Groups: small groups for study, prayer and fellowship that meet throughout the week. Adult Christian Formation is also supported strongly by two orders for lay people: The Brotherhood of St. Andrew for men, and the Daughters of the King for women. For more information, Click Here and contact Kim Nancarrow at kimnan@comcast.net.